After spending months driving up the shares of Tesla, investors seemed ready to run on Monday after outspoken CEO Elon Musk warned that his company could face a half-year of “manufacturing hell” trying to ramp up production of the new Model 3 battery-electric sedan. The Model 3 is Tesla’s long-awaited entry into the mainstream market, with prices ranging from around $35,000 to $60,000. The California carmaker is believed to have as many as 400,000 advance reservations. But it will face a serious challenge, Musk acknowledged, boosting production at the Tesla plant in Fremont, California to the point where it can roll out the promised 500,000 vehicles next year. Investors aren’t the only ones worried. A group of Tesla workers on Monday asked the company’s board to provide a plan that will, among other things, address worker safety during an aggressive ramp-up aiming to boost production almost five-fold from 2017 to 2018. Tesla has come under fire in recent months over allegations of unusually high injury rates at the suburban San Francisco plant. Tesla shares have been wobbly over the past month after hitting an all-time high of $386.99. Investors began to rally last week as the automaker prepared to hand over the first 30 Model 3 sedans during a splashy ceremony last Friday. But the handover event came as almost an anticlimax for Wall Street, and TSLA shares started tumbling after Musk told journalists ahead of the ceremony, "We're going to go through at least six months of manufacturing hell." Can Tesla Master the Assembly Line? The South African-born entrepreneur’s concession really didn’t come as much of a surprise. Industry observers have been questioning for some time the potential for Tesla to hit the 500,000 mark so rapidly — a figure about eight times what the company produced in 2016. And that was with a far less complex line-up of just one sedan, the original Model S, as well as the newer electric SUV, the Model X.
Tesla has had a history of falling short of expectations, with the battery-ute coming to market about two years late due to a variety of technical and design problems. Tesla’s quality has been notoriously uneven. Influential Consumer Reports magazine has repeatedly highlighted issues with the Model S and it still does not recommend the Model X because of issues such as body panel gaps, faulty “falcon wing” doors and electrical problems. “Owners of the more expensive Models S and X are generally more willing to tolerate problems because they have other vehicles they can drive while their Tesla is in the shop,” said David Sullivan, a senior consultant with AutoPacific. Model 3 owners are likely to have only the Tesla to drive, so any quality issues could pose a serious headache, he added. For its part, Tesla recently announced plans to adds dozens of new service centers around the country, as well as mobile vans that would go directly to a customer’s home or workplace to perform service and repairs. Tesla has hopes of bringing production of just the Model 3 to about 5,000 vehicles a week by the end of this year. That would be more than double the factory output of the two existing models. But Fremont not only has to cope with production of three different vehicles but three completely different vehicle platforms, a challenge for even established automakers like Toyota or General Motors. Adding complexity, about one-third of the parts used for the Model 3 will come from suppliers abroad. Related: What to Do With Used EV Batteries? There is no question Tesla needs to get the production line moving fast. The company has lost money during all but two quarters since going public — and was in the black, only then, by using its own, non-standard accounting methods. Development of the Model 3 has cost the company billions, forcing it to launch another stock offering last May. 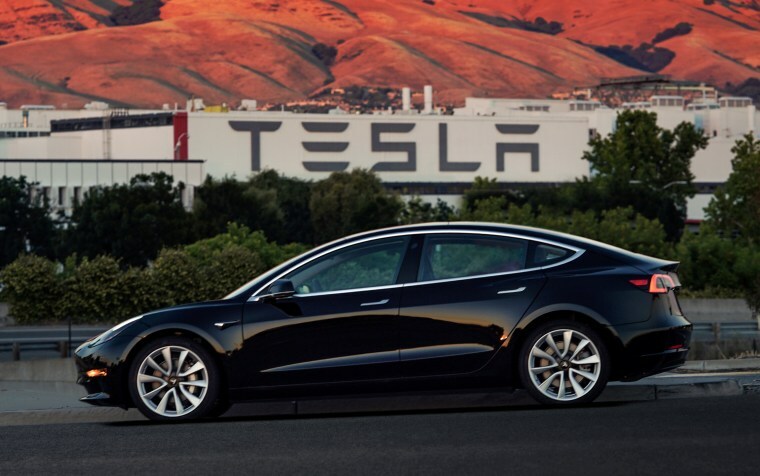 Analysts have questioned whether Tesla would be able to get itself solidly into the black with the Model 3 considering the base $35,000 price tag. But during last week’s ceremonies, Musk revealed that the battery-sedan will be offered with a broader range of high-margin options than had initially been expected, including a longer-range, 310-mile battery pack. In fact, the base model will only be put into production later this year. Tesla will initially focus on a configuration starting at $44,000. And the number is expected to jump to nearly $60,000, according to Brian Johnson, an automotive analyst with Barclay’s, calling that upsell “one of the oldest car dealer advertising ‘tricks.” In fact, most manufacturers promote stripped-down versions of their products that are likely to account for less than 10 percent of total volume. While the up-marketing strategy could deliver stronger profits and margins in the long run, the more immediate question is how quickly Tesla will be able to ramp up production. Even if everything were to go right, Musk previously had indicated all those currently holding reservations likely wouldn’t take delivery of a Model 3 for at least 18 months. Another challenge facing the company is the fact that a broad range of mainstream makers are taking direct aim at Tesla — along with a few battery-car start-ups. So far, General Motors has had only modest success moving the $35,000 Chevrolet Bolt EV. But the list of long-range entries to come over the next two years runs from the mainstream Volkswagen I.D. — which VW hints will cost thousands less than a Model 3 — to upscale products like the Audi e-Tron SUV and even the Porsche Mission E battery sports car. Investors aren’t the only ones worried about the challenging ramp-up at the Fremont assembly plant. There has been growing friction along the assembly line itself. A study released in May by the labor advocacy group Worksafe claimed that the automaker has experienced workplace injuries at a 31 percent higher rate than that of the U.S. auto industry overall. On Monday, a group of workers requested a plan from the Tesla board that would address questions about safety during the Fremont ramp-up, as well as issues regarding employee pay and promotions. Despite the fact that the company’s market capitalization is greater than that of General Motors, Tesla pays some of the lowest wages for hourly workers in the U.S. auto industry, starting at just $18 an hour.